I accidentally deleted a team / game / player. How can I recover it? 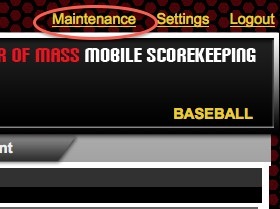 Click the Maintenance link in the upper right corner. 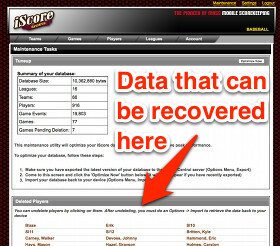 Your deleted data will be displayed at the bottom of the maintenance page, and you can click on the item you would like to undelete. After you have undeleted the data you want back, do an Options -> Import to retrieve the data back to your device. Sometimes users will delete data because they see a duplicate. Instead of deleting data, you should use the MERGE options from the Player and Team Manager screens if you have accidentally created a second copy. Using the above steps, you can undelete your deleted data, then use the MERGE option within the application to combine the data back into a single player / team as needed.